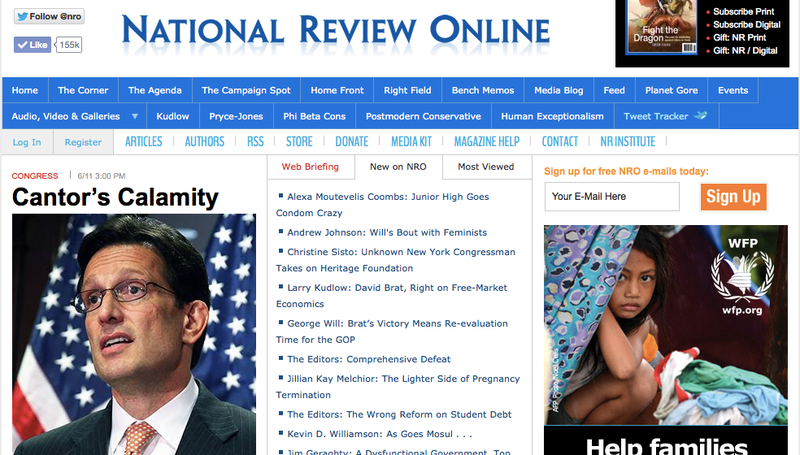 I will never forget the first time I heard about National Review. I was 16 years old, working in our basement office, listening to radio coverage of the 2000 election recount, when I heard the host read the article, The Gore Lies. I wrote down the name of the magazine and headed to the library. I read the latest issue cover to cover, came home, handed my mom a subscription card and said, "This is what I want for Christmas!" National Review has been my conservative Bible over the years. It truly helped me build a solid conservative foundation and understanding of my beliefs and led me to study politics in college and work in it ever since. It was also in National Review that I saw an ad for the high school Young America's Foundation conference which I attended the following summer and then the college conferences in subsequent years. (I was quoted in Time magazine in 2004 as saying, "I'm a conservative because I'm antiestablishment" at that year's YAF conference!) I also credit YAF as being instrumental in my early development of conservative ideas. When I was in college applying for internships, and then later jobs, when I would be asked, where do you envision yourself in 10 or 15 years or what is your dream job? I would respond: Stay at home mom and freelance writer for National Review. Flash forward 14 years and I'm a work from home wife and freelance writer for National Review! Today I had my first article published on National Review! This is truly a career dream come true! You should be able to find all my articles here. I guess now I need a new career goal. Hmmm... Maybe I'll make it to write a book in the next 10-15 years.